NORTH SOUND, Virgin Gorda, VI – Virgin Gorda could soon be home to one of the world’s foremost five-star luxury resorts, at Blunder Bay, North Sound. The decision to have a luxury resort constructed at the location was made public today, November 29, 2018, when government released its ‘Cabinet Decisions,’ taken on November 21, 2018, last. According to the now, public document, the Virgin islands (VI) government—at its Cabinet level—decided, in principle, to finalize negotiations for the purpose of entering into a Development Agreement. 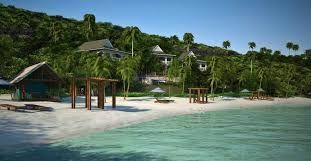 It was noted that the agreement would be inked for a lease with Blunder Bay Development Corporation Limited for the building of a luxury branded, five star, resort at Blunder Bay, North Sound, Virgin Gorda. A precondition however, would include a termination clause and performance bond negotiated with the Developer. The information released did not specify the amount for which the property would be released or special concessions on the table for negotiations. Meanwhile Cabinet also decided that the Hotel Aid Licence for Elizabeth (Lambert) Beach Resort Ltd be amended to include an additional list of items for importation in accordance with the Hotel Aid Ordinance (Cap 290). This would allow the struggling resort to import a wider range of items under special conditions. The Cabinet Meeting was chaired by His Excellency, Governor Augustus J.U. Jaspert and saw Deputy Premier and Minister for Natural Resources and Labour, away on private business. signing for the last time to make sure they are looked after, Lambert Bay resort has money to buy the items but not the money to pay duty? POOR businesses do not need hands up they need to fail so they can be run properly by the next person. Great for those well connected but developments like these do not bring meaningful jobs for BVIslanders unless we raise minimum wage to a living wage. End of the North Sound as we know it. "Meanwhile Cabinet also decided that the Hotel Aid Licence for Elizabeth (Lambert) Beach Resort Ltd be amended to include an additional list of items for importation in accordance with the Hotel Aid Ordinance (Cap 290)." I heard they gave Quito for Quito's Hotel and restaurant hell to bring in his hotel Equipment and charged him an arm and a leg but Others can get the bill amended to get Hotel aid to bring their things...WOW.. And they looking out for local business...Hmmmmmmm. Blunder Bay. .Is this more land the Goverment is GIVING to its friends. It's the last waterfront area in North Sound and we need to see the profession am advice that,s been given . Terms need to be made public. How are Virgin Gorda folks going to benefit. Government does not need to get involved in private enterprise. It didn’t work for Antigua! !